SANAA, Yemen — Warplanes from a Saudi-led coalition kept up their airstrikes in Yemen on Tuesday, targeting the positions of Shiite rebels and their allies just hours ahead of the scheduled start of a five-day humanitarian cease-fire. The strikes stopped shortly before the new United Nations envoy to Yemen, Ismail Ould Cheikh Ahmed, flew into the capital, Sanaa, on his first official visit to the country. He told reporters he planned to meet with various parties, including the rebels known as Houthis, and ensure that the cease-fire holds. “We will discuss the humanitarian truce and the Yemeni parties’ return to the negotiating table,” he said. Security officials said airstrikes overnight, at dawn and during the morning hours targeted weapons depots and other military facilities north and south of Sanaa, a sprawling city of some 4 million people. The military air base that is part of the capital’s international airport also was targeted. Ten strikes hit Sanaa from dawn until about noon Tuesday, the officials said, speaking on condition of anonymity because they were not authorized to talk to journalists. Fierce fighting also raged Tuesday in Taiz between the rebels and forces loyal to exiled President Abed Rabbo Mansour Hadi, officials said. The rebels and their allies also shelled residential areas in the strategic city southwest of Sanaa, with one shell hitting a bus, killing nine people and wounding 40, officials said. An airstrike targeted the city’s al-Qahira castle, from which the shelling came, they said. The cease-fire, scheduled to begin at 11 p.m. (2000 GMT, 4 p.m. EDT), is meant to help ease the suffering of civilians in Yemen, the Arab world’s poorest country. The conflict has killed over 1,400 people — many of them civilians — since March 19, according to the U.N. The country of some 25 million people has endured shortages of food, water, medicine and electricity as a result of a Saudi-led naval, air and land blockade. Anticipating the truce, the U.N. refugee agency, UNHCR, said it plans to airlift 300 metric tons (330 tons) of sleeping mats, blankets, kitchen sets and plastic sheeting from stockpiles in Dubai. The airlift, it said, was part of what it called a “larger aid mobilization underway for a quarter of a million people.” The agency also will attempt to distribute aid already stored in Yemen and assess the needs for areas that have been difficult to reach. Separately, the U.N. World Food Program said it was ready to provide emergency food rations to more than 750,000 people. A WFP-chartered vessel, meanwhile, arrived in the Yemeni Red Sea port of Hodeida on Saturday, carrying 250,000 liters (66,050 gallons) of fuel and supplies for other humanitarian agencies. A second vessel is ready to dock with an additional 120,000 liters (31,700 gallons) of fuel. Tuesday’s airstrikes came one day after the coalition pounded a mountainside on the northeastern edge of Sanaa, hitting arms and ammunition depots. The bombardment shook the entire city, causing some homes to collapse. They also caused shells in the depots to explode. Munitions also hit residential areas, starting fires. The Houthi-held Health Ministry said Tuesday that preliminary figures show that Monday’s airstrikes killed 69 people and wounded more than 100, mostly civilians. Among the dead were eight members of one family, said survivor and family member Mohammed al-Watary. He said three of his younger siblings — ages 3 to 7 — were killed when a rocket from an ammunition depot smashed into the extended family’s home. Also killed were five female relatives. His mother and two female relatives were badly wounded, he said. 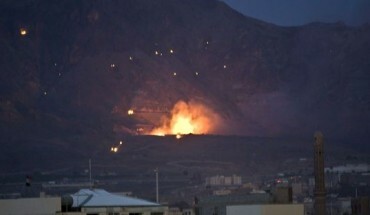 The officials said the strikes were among the strongest in Sanaa since the Saudi-led air campaign began March 26 against the Houthi rebels and their allies in the army and security forces loyal to former President Ali Abdullah Saleh. The Houthis and Saleh’s forces overran Sanaa and much of northern Yemen late last year and have been on the offensive in the south. Western nations say Shiite power Iran supports the Houthis military — something the rebels and the Islamic Republic deny. The Saudis and their allies are seeking the restoration of Hadi, who fled the country in March. Also Tuesday, Human Rights Watch said the Houthis have intensified the recruitment, training and deployment of children in the conflict in violation of international law. Since the rebels seized Sanaa in September, it said, the Houthis increasingly used children as scouts, guards, runners and fighters, with some children being wounded or killed. “The Houthis and other armed groups using child soldiers in Yemen should immediately stop recruiting children, including ‘volunteers,’ and release all children in their ranks,” it said. The security officials said Monday the Houthis were recruiting boys as young as 15 in Sanaa to fight in Saada, the rebel stronghold north of the capital, against Sunni tribesmen trying to enter the province that sits along the border with Saudi Arabia. Islamic militant websites, meanwhile, said Tuesday that four leading members of Yemen’s al-Qaida branch were killed the previous day in a suspected U.S. drone strike in a southern port city. The four died in Mukalla on the Arabian Sea, where rockets believed to have been fired by U.S. drones hit al-Qaida militants based in the city’s presidential residence, according to security officials. The militant Aamaq website, affiliated with the more extreme Islamic State group, said the four included Maamoun Hatem, reportedly an Islamic State sympathizer. The three other militants were identified as Abu Anwar al-Kutheiri, Mohammed Saleh al-Ghorabi and Mabkhout Waqash al-Sayeri. The compound in Mukalla was recently captured by al-Qaida’s branch in Yemen, which is viewed by Washington as the terror group’s most dangerous affiliate.